S. Beckenstein was Samuel Beckenstein (1893-1968) an immigrant from Poland. He became a U. S. citizen in 1933, and declared on his naturalization petition that he was born 5 June 1893 in Liskova, Poland, and that he emigrated from Antwerp, Belgium, under the name Israel Beckenstein on the vessel Vaderland. His arrival in New York was 27 Sept. 1910. He is found in several census reports from 1915 to 1930 under the name Isidor Beckenstein. In 1915 he was 22 years old and lodged with Harris Levine at 254 Henry St., Manhattan. His occupation was "rag dealer." He registered for the World War I draft in 1917 as Isidore Beckenstein, age 23, born 5 Jan. 1893 in Leskova, Grodna, Russia. He lived at 79 Orchard St., and was a pedlar in business for himself at 519 Water St. (Grodna, aka Grodno or Hrodna, is a city in present day Belarus close to the border with Poland. Was Leskova a nearby town?) In the U. S. Census of 1920 he lived at 75-9 Orchard St., age 26, an alien resident, born Russia, immigrated 1911. With him were his wife, Fanny, and two children, Dorah, age 3, and Beatrice, 5 months. In the 1925 New York State Census he was Isidor Beckenstein, age 30, born Russia, living at 204-6 Eldridge St., Manhattan. In 1930 he was still Isidor Beckenstein, and lived at 110 Delancey St. His family consisted of his wife, Fannie, and three daughters, Beatrice, Ruth, and Lillian. It was not until the 1940 U. S. Census that Beckenstein registered as Samuel Beckenstein. He was now 45 years old, the proprietor of a woolen concern, and his daughters were Beatrice, 21, Rosalyn, 16, and Lillian, 11. In his death notice, New York Times, 26 Dec. 1968, Samuel Beckenstein was survived by his wife Fanny, Beatrice and Irving Boyarsky, Ron and Murray Greenberg, Lillian and Sol Horowitz, and a brother Paul. The Boyarskys and Greenbergs were Beckenstein's successors in his business. Samuel Beckenstein's earliest appearance in New York city directories was in 1917, when he was "rags" at 519 Water St. and lived at 79 Orchard St. The New York telephone directory listed him the same year at 519 Water St. and described the business as "new woolen clippings." The business moved to Orchard St. in 1922. There were two addresses, 118 Orchard and 123 Orchard. 123 Orchard became 125 Orchard in 1937, and a third branch was opened in the former New York Telephone building at 130 Orchard St. in 1945. A photograph of a sign for S. Beckenstein's, 125 Orchard St., in 1939 is found on the website BoweryBoogie.com. The sign claims, "World's Largest Pants Matching House." A photograph of Beckenstein's branch at 125 Orchard St. in 1953 is found on the website Pictures of Vintage Americana. Signs on the store read "Imported Woolens," "Ready Made Slacks" and "Matched and Made to Order." An article in Vanity Fair, June 2005, explains that the matched pants were "for those who couldn't afford a new suit and instead would purchase an exact copy of their tattered trousers." 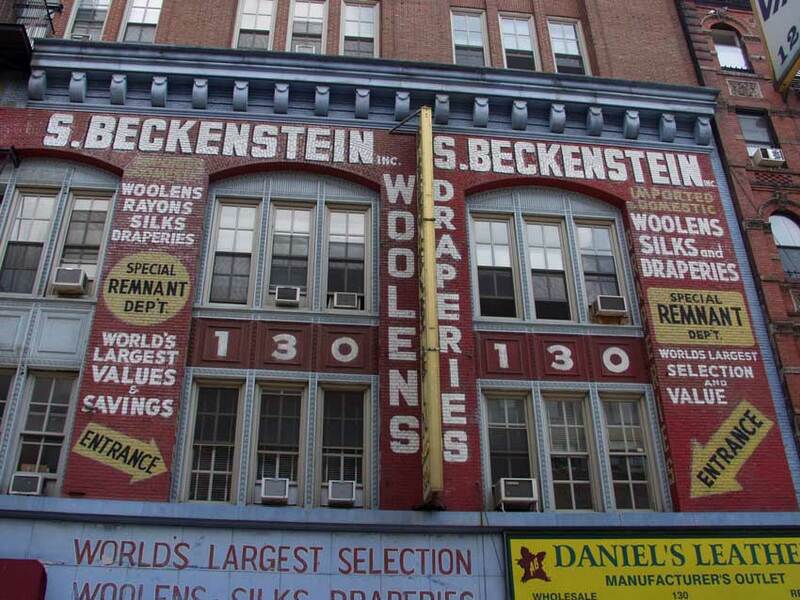 S. Beckenstein Inc. was located at 130 Orchard St. from 1945 to 1999. In 1999 the following appeared in New York Times, "No spiel-makers are needed at Beckenstein Home Fabrics, a home decorating business that has lured generations of design-savvy shoppers to its store inside a former telephone company switch exchange at 130 Orchard Street. It is part of a small empire that Samuel Beckenstein started some 80 years ago selling rags from a pushcart on Water Street. He grew the business and diversified into men's tailoring, women's clothing, draperies and upholstery. Other businesses came and went in the neighborhood, but Beckenstein's stayed and prospered. But like the immigrants who passed through the nearby tenements on their way to success, uptown beckons. Garry Greenberg, 46, the third-generation president of the home fabric store, is moving to a new location at Fifth Avenue and West 20th Street in the Flatiron district later this month, the better to compete with the other upscale home décor stores in that area." The building at 130 Orchard St. was constructed in 1902 as a 3-story and basement brick and stone telephone exchange for the New York Telephone Company (Office for Metropolitan History). The present (2013) structure is 6 stories. Apparently three stories were added around 1920. Emporis.com cites "construction end 1920."